Worried about your pesky hair hindering you from planning a beach getaway? Well, read on as I share my Lay Bare’s Thorough Care experience! Like you, I get dyahe when I have hair in areas I want to flaunt. It's that one thing we hardly talk about but things we need to deal with privately! You’re not alone! I share this very dilemmz and I’m telling you not to worry. Put that shaver down, don’t burn yourself with DIY waxing kits because there’s more options for you to be hair-free, worry-free! Lay Bare wants me to share with that they will take care of you from brows to toes when it comes to your waxing needs as they have been for years now. Their goal is not just to give us hair-free skin but softer, smoother and lighter skin that we so deserve using organic cold wax accompanied with tried-and-tested hair removal techniques they have mastered for nearly a decade. I recently visited Lay Bare Waxing Salon Connecticut Arcade in Greenhills to get my half leg waxed and by brows groomed. I was bordering werewolf/woman and I doubt my husband can tell the difference. LOL! 3. Wax the area using an organic cold-jelly wax that is unique only to Lay Bare waxing salons. 4. Lie down and relax, their waxing ladies are very well trained in this unique and hygienic way of waxing. 5. Application of anti-bacterial lotion. TAKE NOTE: It's important that you shouldn't wet the area for 24 hours to allow the pores to close. This prevents chicken skin and infection. Lay Bare offers products that help maintain a hair-free and smooth skin like deodorant, lotion, soothing cream and lightening lotion. This holistic, yet simple and easy way of hair removal process provides the utmost Thorough Care to have lighter, softer, and smoother skin that only Lay Bare can promise. The process of cold jelly waxing is fairly pain-free and fast. It took about a few minutes to do both half legs and I was pleased with the results. You can take a look at the photos below. Lay Bare also provides a private atmosphere for their clients. There is a separate room with an actual bed that is maintained by an aesthetician. These aestheticians underwent rigorous training in cold jelly waxing and how to provide a pleasant hair removal experience. I know for a fact that there are women who refuse to do this because they can't have another person look at their privates. No worries, Lay Bare prides in their staff having excellent bedside manners. Ate Jane took care of me and she’s awesome! She's one perky woman and she made me feel comfortable from the moment I met her. She's ma-chika which I prefer because it distracts me from having a low of pain threshold. She's very engaging and asked me with the right amount of duration how I was and if I have any concerns. Maagan ang hands ni Ate Jane so there was less pain than I anticipated. To rate it, the pain level is a 4 out of 10 (10 being the highest). With affordable rates and numerous branches all over the country, Lay Bare pretty much made it easy for us to be hair-free all year long! My favorite branch now is the one in Greenhills Connecticut Arcade because it's easy to access and I don't have to go through a mall to get to it. It's situated near a spacious parking lot and I can Uber easily from this location. But how lucky am I that a fresh new branch is opening in the same street I live! My experience was like all the many number of times I've been to Lay Bare, quick, virtually painless and happy to be hairless! 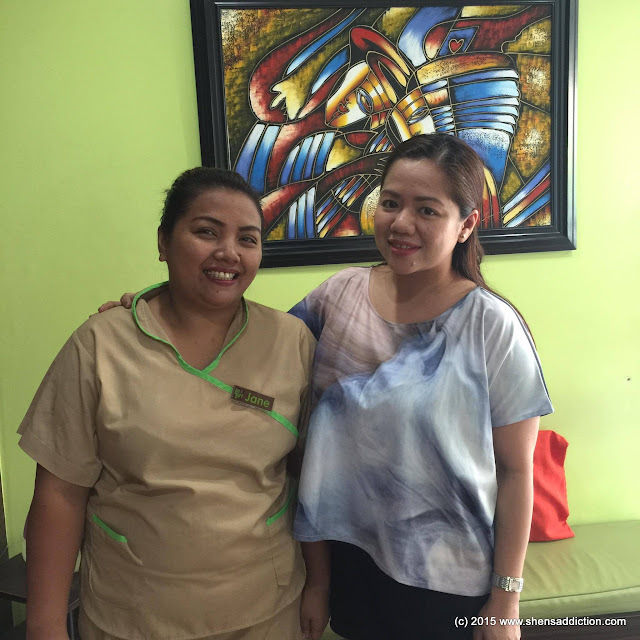 Thank you, Ate Jane, for the half leg wax and eyebrow thread! You are awesome! See you in a few weeks!